The Maryland Environmental Service (MES) was created in 1970. MES is a state agency and a non-profit corporation, uniquely equipped to provide a wide range of environmental programs to public and private agencies. MES provides innovative, cost-effective services in such areas as drinking water, waste water and storm water treatment, and in solid and hazardous waste management, recycling and composting and co-generation plants. MES combines the public sector’s commitment to environmental protection with the private sector’s efficiencies, flexibility and responsiveness. In recycling, MES provides technical assistance on recycling programs, operates materials recovery facilities (MRFs), markets recyclables, designs new recycling programs and conducts buy recycled training. The Buy Recycled Training Manual provides information on existing buy recycled efforts, available recycled products and techniques to improve buy recycled programs in public and private organizations. Richard Keller, Manager of Recycling for MES, was the principal author of the manual. Any listings or discussion of specific products do not imply endorsement by the Maryland Environmental Service or the State of Maryland. Successful recycling is a full circle, three-step process. It begins with collecting and separating recyclable materials. Manufacturers then convert these raw materials into new products. Finally, the recycled products return to the marketplace as new consumer goods. As recyclers have discovered, however, the process often halts at step two. The marketplace potential for recycled goods is expanding rapidly. More and more products made from recycled materials are available. The most immediate recycling challenge is to change consumer buying habits, especially those of large government, institutional and business buyers. The Maryland Environmental Service (MES) meets this challenge with the Buy Recycled Training Manual. The publication is a companion to a buy recycled training program, but can also be used independently. MES has designed the manual for both public and private agencies. The manual explains the process of routinely buying recycled products in place of products traditionally made from virgin materials. The manual discusses current programs, available products and purchasing options that will help you establish a buy recycled program or expand an existing one. The manual also includes sources of information on recycled content products. As represented by the three arrows in the recycling symbol, recycling involves three elements: collection, manufacturing and reuse. The three elements must be in balance to fully realize the potential of recycling. Merely collecting recyclables is not recycling. Recycling does not occur until recovered materials return to the economic mainstream as new raw materials or products, and a consumer uses those recycled products. Therefore, unless businesses, governments and consumers buy recycled products, materials collected for recycling will continue to require disposal. The term “recycled product” means a product made in whole or in part from secondary material recovered from converting or post-consumer sources. (There is more information on definitions of recycled products later in this Chapter.) “Recycled product“ may also mean a product that is reused, rebuilt or remanufactured, such as reused equipment, a rebuilt engine or a remanufactured laser toner cartridge. In addition to looking at recycled products, this manual will discuss buying habits that contribute to waste prevention. This includes buying only those products that we need, buying products that reduce the volume of waste (such as double-sided copying) and buying recyclable products. Buying for waste reduction involves similar techniques to those needed to buy recycled products. The manual will also discuss “green purchasing” or environmentally preferable purchasing, which considers not only recycled content, but other environmental features such as less toxic and energy conserving products. Creates New Markets – Buying recycled products helps create long term, stable markets for recyclable materials, and help improve revenues from recycling programs. Reduces disposal of recyclables – By creating markets, recycled products help increase recycling and decrease the amount of waste needing disposal. Convinces manufacturers to increase use of recycled materials – In order to use recycled materials, manufacturers must invest millions of dollars in processing and other equipment. To justify the investments, there must be demand for the finished recycled products. Buying recycled products helps create the demand. Conserves resources and energy – Buying recycled products reduces our dependence on virgin raw materials. Using recycled feedstocks often saves energy over virgin manufacturing processes. It can also reduce pollution. Creates jobs and economic development opportunities – Buying recycled products helps create markets so that recycling businesses can expand and increase jobs and local economic development. Meets Organizational Goals and Requirements – As we will see later in this chapter, there are federal, state, local and private policies on buying recycled products. Buyers and using agencies can meet these requirements by establishing quality programs to buy recycled products. Leadership by Example – Public and private agencies that establish quality buy recycled programs can set an example for employees, customers and other organizations. Provides a Proactive Approach Rather than a Reactive Approach – Establishing buy recycled programs now allows organizations to design programs to meet their specific needs, rather than reacting to more restrictive rules in the future. Public relations – Buying recycled products can foster goodwill among your employees, customers and citizens. Cost savings – In the long run, buying recycled, recyclable, and waste reduced products can reduce agency costs. Many recycled products are already less expensive than their virgin counterparts. Federal, state, local and private agencies have developed programs to increase purchases of recycled products. This portion of the manual summarizes those efforts. The U.S. Environmental Protection Agency has established procurement guidelines to assist “procuring agencies” (federal agencies, state and local agencies using appropriated federal funds and government contractors) in buying recycled products. The guidelines apply to procurements costing more than $10,000. Even if state and local governments and private companies are not required to comply, they can use the minimum content standards to help design their own programs. Preference Program – Agencies must institute practices and procedures that prefer the procurement of recycled products. Procurement methods may include using minimum content standards (identifying the minimum recovered content that an item should contain), a case-by-case procurement (an open competition where an agency provides a preference for products with recovered materials), or an equivalent approach. Promotion Program – Agencies must actively promote their desire to buy recycled products, including information in bid documents, pre-bid conferences, general announcements and in recycling statements or logos on official documents. Estimation, Certification and Verification – When submitting bids, vendors must estimate the percentage of recovered materials that will be delivered under a subsequent contract. Then, they must certify the actual content of recycled materials in the products delivered under a contract. To verify the validity of the contractor’s certification, agencies must confirm that the amount of recycled content in the products delivered under the contract equals the amount certified by the contractor. Vendors must obtain this information from manufacturers. Annual Review and Monitoring – Agencies should review the estimates and certifications to determine if they are using the highest percentage of recovered materials. Agencies should adjust minimum content standards if market conditions warrant a change. Procuring agencies may choose not to buy a recycled product if the price is unreasonable, there is inadequate competition, the products are unavailable in a reasonable period of time, or the product does not meet reasonable performance standards. EPA developed guidelines for five products in the 1980’s – paper and paper products, re-refined oil, retreaded tires, building insulation and cement and concrete containing fly ash. As of September 2007, EPA had designated 61 recycled content products for a purchasing preference under the program. EPA has added to the list of designated items through Comprehensive Procurement Guidelines (CPG), that designate items that are or can be made from recovered materials. At the same time, EPA recommends procurement practices and minimum content standards for each item through a Recovered Materials Advisory Notice (RMAN). CPG I (May 1995) established eight new product categories and designated 19 new items. CPG II (November 1997) designated an additional 12 items. CPG III (January 19, 2000) designated 18 new items. In April 2004, CPG IV designated seven new items. In September 2007, CPG V revised the compost definition and added fertilizer made from recovered organic materials to the landscaping products category. Each of the CPGs was accompanied by a RMAN, providing new content standards for each item. On January 24, 2007, President George W. Bush signed Executive Order 13423 – “Strengthening Federal Environmental, Energy and Transportation Management.” The Order calls on Federal agencies to “conduct their environmental, transportation and energy-related activities . . . in an environmentally, economically and fiscally sound, integrated, continuously improving, efficient and sustainable manner.” The goals include requiring “in agency acquisitions of goods and services (i) use of sustainable environmental practices, including acquisition of biobased, environmentally preferable, energy-efficient, water-efficient and recycled content products, and (ii) us of paper of at least 30 percent post-consumer fiber content.” The Executive Order revoked previous Executive Orders on buying recycled content products. For more information on the Executive Order and federal buy recycled activities, visit the Office of the Federal Executive web site at www.ofee.gov. General Policies Favoring Recycled Products – Many agencies have language that generally favors recycled products, such as buying products “where feasible.” This general language is rarely enough to ensure a sustainable, long-term program. Price Preference – The organization is willing to pay a premium (usually up to 5 or 10 percent more, if needed) for a recycled product. Many organizations are prohibited by statute from using such a preference. Other organizations simply include recycled content as a requirement in the specification. Set Asides or Goals – A certain percentage of total purchases must include recycled content. 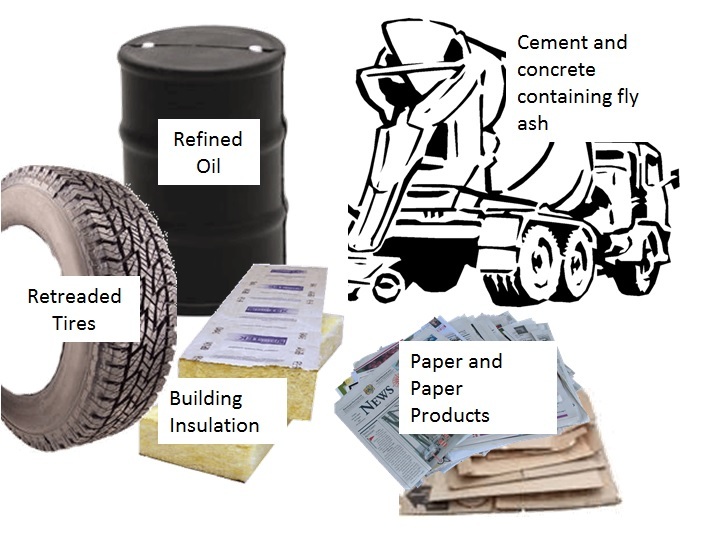 Purchasing a wide variety of recycled products, including paper, rerefined oil, retread tires, insulation, plastic products, vehicle products, recycled products for road and building construction, etc. Publishing detailed annual reports on the program. Successful state and local efforts require a commitment from recycling, purchasing and using agency staff. See the discussion on Making a Commitment to Buy Recycled later in this chapter. The State of Maryland, through the Department of General Services, has a long history of programs for recycled and environmentally preferable products. For example, Maryland was the first state to mandate large purchases of recycled paper. In 1977, the legislature passed House Bill 153 which requires the State to increase its purchase of recycled paper (paper containing 80 percent post-consumer waste) to five percent of the total paper purchases by 1978, 25 percent by 1981, and 40 percent by 1985. In addition, DGS is required by law to prepare a list of acceptable recycled products. DGS currently has on its website a listing that includes acceptable products that are currently under a state contract and those products that are included under the U.S. EPA guidelines. DGS is working with state agencies to implement the Green Maryland Act. They have already developed draft green purchasing guidelines related to energy using equipment. Key issues include definitions of terms, what standards will be used and what products meet those standards. Under state law, a unit of state government must purchase from MCE any goods and services that are available from MCE at a price not exceeding the prevailing average market price as determined by DGS. The quoted prices are in compliance with preference law and regulation. MCE has a variety of furniture products, including seating, furniture, tables and accessories that have been certified by the Greenguard Indoor Air Quality program, which rates chemical emissions for low emitting interior materials, furnishings and finish systems. Their recycled office products include business cards and envelopes. MCE is currently updating their list in response to the implementation of the state law. Blind Industries and Services of Maryland’s (BISM) purpose is to positively change people’s attitudes about blindness. Each year, BISM provides programs and services that serve over 2000 blind Maryland citizens. BISM produces over 150 quality products, including office products, janitorial supplies, uniforms, grocery tote bags and assembly and packaging. Like MCE, under state law, a unit of state government shall purchase from BISM any goods and services that are available from BISM at a price not exceeding the prevailing average market price as determined by DGS. BISM’s recycled and environmentally preferable products include cleaners that meet Green Seal and other standards, paper towels and toilet tissue, trash can liners and paper and easel pads. Maryland Works, Inc. (sheltered workshops) also sells materials from BISM. BISM is currently in the process of expanding their listings of recycled and environmentally preferable products, but is awaiting approval from DGS. The website also allows the user to specify recycled products only. Staples is currently working on promotional material that will have a short list of recycled products. The catalog uses third party certifications for many products, including the Carpet and Rug Institute Green Label, Energy Star, Green Seal, AP Non-Toxic and Scientific Certification Systems (SCS) Recycled Content. Rudolph’s is also working on a shorter factsheet that lists commonly used recycled and environmentally preferable products. Much of the early effort in buy recycled focused on establishing programs at the federal, state and local government level. While these efforts are important, government purchases represent only about 20-21 percent of the Gross National Product. In order for buy recycled efforts to expand, we need to get businesses and consumers involved in buying recycled. environmentally preferred paper products and maximize the efficient use of paper. The Coalition focuses on purchases of paper containing post-consumer content. This helps strengthen the market for recycled paper products. The National Office Paper Recycling Project, formed in 1990, was a collaborative effort by corporations that manufacture paper, produce office machines that put images on paper, and those that collect office waste paper. Their goal was to increase recycling of office paper to 65 percent by 2000. The definition of “recycled” varies widely. There are different definitions for categories of recyclable materials and different minimum content standards for recycled products. The lack of standardization and consensus has made it more difficult for recycled product manufacturers to compete with manufacturers of virgin products. Recovered materials” means waste materials and by-products that have been recovered or diverted from solid waste, but such term does not include those materials and by-products generated from, and commonly reused within, an original manufacturing process. What standards should buyers and using agencies follow? Manufacturers generally have an economic incentive to use pre-consumer materials, since they are easier to collect, cleaner, more consistent, and therefore have a higher value. Economic incentives are necessary, however, to establish collection programs for post-consumer materials. Additionally, most recycled products sold in the marketplace make distinctions based on pre-consumer and post-consumer content. Most state and local laws on buying recycled products also make these distinctions. Buyers and using agencies should use standards with a total recycled content and a percentage of post-consumer material, or a standard specifying pre-consumer and post-consumer material. When businesses and governments make a commitment to buy recycled products, they convince manufacturers that a consistent, long-term demand exists for recycled products. This encourages industry to invest in recycling equipment. Organizations make commitments by establishing a buy-recycled law or policy through legislation, executive orders and formal changes to administrative policies. * Set-aside or goal where a certain percentage of total purchases must have recycled content. – Using Agencies specify recycled products in their bid documents, ask existing suppliers for recycled products, use the recycled products and provide information on successes (and failures) of recycled products for annual reports. It is important that organizations give these agencies some ownership of the program and that everyone listens to their concerns about recycled products. Agencies must also work closely with potential suppliers of recycled products to expand purchases of these products. Montgomery County has taken a leadership role in Maryland and in the nation by enacting Bill 32-90, which requires the County to purchase, where practicable, products and supplies containing recycled content. The new law, which became effective July 1, 1991, will help create markets for recycled materials collected in the County, and provide government leadership to encourage similar efforts in County businesses. The provisions of the law include a price preference of up to 10 percent for recycled products, a goal of at least 50 percent of the dollar volume of paper and paper products being recycled paper, and requires purchases of recycled products (such as paper, oil, plastics, compost, concrete, insulation, solvents, and rubber products) wherever practicable. The Office of Procurement needs the assistance of all agencies in changing specifications to allow the use of recycled products, requiring recycled products when they are available, asking bidders to supply recycled products, and providing information on actual purchases. If recycled products are available and you are not requiring them in your bid, the Office of Procurement will require a written justification on why you are requesting virgin products. STEP 3 Examine product and contract lists to determine where you can substitute recycled products for virgin products or included in future bids. There are three considerations to keep in mind when buying recycled products – availability, quality and cost. Buyers and using agencies should examine these issues before making a purchase. There has been a dramatic growth in the availability of recycled products. As shown in Chapter IV, there are a wide variety of products available for many end uses. While some recycled products are available throughout the country, others are only available in certain regions. Because demand for products varies, manufacturers and vendors need sufficient lead time to fill an order. Appendix 1 includes web sites for many organizations who can assist you in your buy recycled efforts. Don’t be put off by the misconception that recycled products are necessarily inferior. In the past, some recycled products did compare unfavorably to new products. Increased demand and major changes in technology have resulted in improved products that are competitive with new products. To ensure that manufacturers continue to product quality recycled products, buyers and using agencies should regularly test recycled products for quality and performance. There is additional information on testing in Chapter 3. Recycled products are not always more expensive than the equivalent virgin product. Some recycled products are always less expensive than their virgin counterparts. Pricing for recycled products is usually based on economies of scale, not on the basic cost of virgin and recycled products. As demand increases, recycled products move from specialty items to shelf items and prices become competitive. Prices for both virgin and recycled products depend on the specific product, the economy, geographic considerations, and many other factors. Specifications reflecting only real performance needs, comparison shopping, bulk purchases, competitive bidding and using life-cycle costing are the best ways to control costs. Increasing the number of bidders and the number of departments that participate in the bid can help reduce the unit prices for recycled products. You can find more bidders using the resources listed above. Ask bidders to identify the percentage of recycled content, including post-consumer content. This will help identify new bidders for recycled products. Cooperative purchases among agencies can increase the number of participants and volumes purchased and can reduce unit prices. Unit prices for some recycled products (such as printing and writing paper and mixed plastic lumber) can be more expensive because manufacturers of recycled products often have smaller production capabilities than virgin manufacturers. Thus, the economies of scale favor the virgin products. When the demand for recycled products rises, manufacturers will be able to increase their capacity and unit prices will fall. However, do not be too quick to conclude that the unit price is the only method for cost comparison. Another factor to consider is life-cycle cost. Recycled products can often save on maintenance or replacement costs, reduce the cost of disposal, and increase prices for the recyclable materials you collect. In a life-cycle cost analysis, these ancillary savings and revenue sources are factored into the unit price. Another method of minimizing the long-term costs of recycled products is to establish a waste prevention program. Waste prevention programs will save far more money than any additional expense of buying and using recycled products. See Chapter XIII for information on waste reduction techniques. Shop Around – Take the time to compare prices. Buy in Bulk – Buy in larger quantities and participate in cooperative purchasing programs where they are available. Conduct Competitive Bids – Find as many potential vendors as possible for each bid. Use the resources described in Chapter IV to identify bidders. Figure Life-Cycle Cost – Add maintenance, replacement and disposal costs to the unit cost of an item to calculate the long-term costs to your organization. Start a Waste Prevention Program – Institute waste prevention programs that will prolong the life of the products you buy, reduce disposal costs and help defray any additional cost of recycled products. Don’t be afraid to ask manufacturers and suppliers for a recycled product. Even if it is not available now, it may be available in the future. Consistent demand can provide incentive for manufacturers to produce recycled products. In addition to demanding recycled products from regular bidders, buyers and using agencies should actively seek out new manufacturers and bidders of recycled products. “Seek and ye shall find,” is the best approach for fueling the supply and demand cycle for recycled goods. Include language in your letters to bidders and bid documents indicating your interest in buying recycled products. Discuss the buy-recycled program at pre-bid conferences. Here’s an example of how supply and demand dynamics work in today’s rapidly changing marketplace. At one time, no coated recycled papers were available (for products such as calendars or annual reports) in the marketplace. Industry experts indicated that it would be several years before such products would be available. Demand for coated papers continued, and in less than a year, the product was available. Some bidders supply both new and recycled products. If you do not specifically ask for recycled products, bidders may automatically supply you with new products as they have done in the past. It is important to help break old habits by consistently requesting recycled products. If your current supplier is unable or unwilling to supply recycled products, look for another supplier. Most suppliers are eager to meet your needs in order to protect their market share. Buyers and using agencies should review renewable contracts (at the end of each base period or option period) to determine the availability of recycled substitutes. If necessary, modify the contract or reissue it for competitive bidding to obtain the maximum amount of recycled products. If agencies simply extend existing contracts for virgin products, there will be no opportunity for recycled products to compete. Additionally, expand bidders’ lists to include recycled product manufacturers for all bids where you may use recycled products. Widely advertise new bid opportunities. Be sure to train employees to look for opportunities to use recycled products and to request recycled products whenever possible. It is not necessary to start from scratch when writing specifications for recycled products. Simply modify existing specifications, but do some homework first. Start by talking to the using agencies and representatives from the supplier industry (bidders and trade groups) so that you can develop realistic standards for recycled content. Talking to both sides will help you avoid hidden pitfalls in the specifications that may prevent recycled products from competing. Include a paragraph in the bid document emphasizing your interest in buying recycled products made from post-consumer materials (if applicable for the product). Pre-bid conferences provide an opportunity to remind bidders that you want recycled products. Use existing standards, definitions and percentages wherever possible. If all states, local governments and businesses establish their own standards, manufacturers must produce specialty items to fill each order, instead of making a single product (at a more competitive price). Use the existing definitions discussed in Chapter 1. Minimum content standards should contain percentages are high enough to increase use of recycled products (especially post-consumer materials), but not so high that they exceed the capabilities of existing technology or limit competition. Require bidders to certify the percentages of pre-consumer and post-consumer material (even if the percentage is zero). Ask bidders to provide a letter from the manufacturer verifying that the product meets any minimum requirement and what the minimum percentage is (if it is above or below the standard). This will allow you to track changes in the marketplace and adjust minimum content standards to meet these changes. Amend your bids and specifications to remove obstacles to using recycled material. Eliminate obvious phrases, such as a “virgin only” or “no recycled material allowed.” Less obvious requirements, such as requiring a certain color, awarding bids on an all or none basis (recycled product vendors may be able to supply some, but not all of your products); unreasonable quantity requirements; and unrealistic response and delivery times, also need to be altered to open the market to recycled products. Find out what bidders, manufacturers, industry sources, and other buyers needed to allow recycled products to compete. Use pre-bid conferences to discuss the specifications, and give industry representatives and using agencies the opportunity to amend the specification to allow recycled products to compete. Request recycled products with no preference – You may allow both virgin and recycled products to compete, but ask bidders to supply recycled products (without providing any preference for recycled products). While this method opens up the marketplace for recycled products, it may not provide the maximum use of those products. be considered “recycled,” and b) a determination of the price preference for the product. 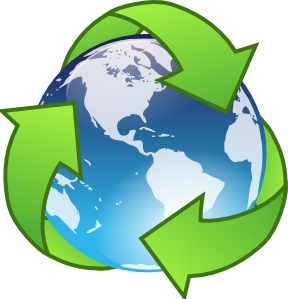 Recycled only – If adequate competition exists for a recycled product, the bid can require only recycled content. In other words, if the product does not meet the minimum content requirement, the bid is considered non-responsive. Requiring recycled content can be used independently (to buy the maximum amount of recycled products), or can be used to meet the requirements of a goal or set aside program. * construction products for new and renovated buildings. It is important to test recycled products to make users comfortable in using the recycled product. Test results from other organizations and testing labs are available for many products. Since your conditions may vary, make sure that the test is applicable to your situation. In some instances, you may need to test recycled products on your own equipment under your own conditions. Consider blind tests for recycled products. Some users, jaded by a poor experience with recycled products in the past, may automatically think that recycled products are inferior. Give the products a fair test. Do not expect superior performance; only require that they perform as well as a virgin product. If the recycled product fails, do not assume that the failure was due to recycled content. The failure was more likely the result of some manufacturing problem. Resolve the issue with the manufacturer using the same techniques you would use with a new product. Be sure that you buy the recycled product designed for the intended end use. For example, buy reprographic paper to use in the copying machine. Finally, keep copies of test results on file. This will help resolve disputes and provide information to using agencies or other public or private agencies interested in using the product. Public and private agencies obtain many products and services through contracts and grant agreements. The recent trend toward privatization could result in an increase in these types of procurement activities. Organizations have an excellent opportunity to expand their buying power by encouraging outside contractors to use recycled products when serving the agency. You can require printers, for example, to use recycled paper (with post-consumer content), double side all materials and use non-toxic inks for your printing job. Ask any organization doing business with you to use recycled, recyclable and waste reduced (such as double-sided copied) products. Items such as utility invoices, bank statements, legal documents from outside attorneys, accounting statements, insurance information, proposals and bids, permit applications and zoning requests are just a few of the routine business documents that can easily be prepared on recycled paper. Ask contractors to double side all written reports. Legislative bodies generate enough paper work to have a substantial effect on the sale of recycled office products and on waste prevention efforts. They can print copies of bills, summaries, reports and ordinances double sided on recycled and recyclable paper. This allows these bodies to demonstrate recycling and market development leadership beyond passing legislation. and recyclable paper printed on both sides, where practicable, with removable bindings or staples. printed on both sides, where practicable. be submitted in writing to the Purchasing Manager. Cooperative purchasing is a system where organizations with similar purchasing needs pool their purchases into a single bid instead of buying products individually. It is a system than offers many benefits to participating organizations, but involves advance planning, cooperation, and sacrificing some purchasing autonomy. Cooperative purchasing is an old concept, with a new application to buying recycled products. before shipping recycled products. Cooperative purchasing may help meet the minimum requirements. stock items instead of specialty items. Before starting a cooperative purchasing program outside your agency, make sure that all internal purchases are being made on a cooperative basis. Various departments should buy products at the same time to enjoy the benefits of cooperative purchasing. There are obstacles to overcome before setting up a successful cooperative purchasing arrangement. Each participating organization must be willing to give up its purchasing authority to become part of the cooperative agreement. One organization must function as the lead agency for the procurement (although organizations can share the responsibility on bids for various recycled products). The participants may have different legal or purchasing requirements – such as minority, small business, price preferences, or other requirements – but they can address those items in the cooperative agreement. If participants normally buy products on a varying schedule, they will have to plan ahead to make sure supplies last until they complete the next cooperative bid. Finally, cooperative purchasing may change an agency’s relationship with local vendors. Cooperative agreements often involve new vendors from outside the region. Sometimes cooperative purchasing eliminates small bidders because they are unable to fill large orders. Despite these obstacles, cooperative purchasing can increase recycled product purchases and reduce costs. Be sure that each participant has the legal authority to buy cooperatively. Select a lead agency, which will prepare the specification, obtain and evaluate bids, and monitor implementation. Survey potential participants to determine who will be included in the bid. It is important that participants fully participate, since bidders will offer a lower price based on anticipated quantities. Obtain information from agencies, such as quantities needed, purchasing schedules and delivery points. Research the appropriate industry to obtain information on potential recycled product bidders and appropriate definitions, standards, and specifications. Prepare and advertise the bid. Consider whether bidders must respond to all or part of the bid, and whether you will award one or multiple contracts. Resolve disputes and any other implementation difficulties. The closed loop concept is based on the assumption that a public or private group (individually or in cooperation with other organizations) would set up a program to collect recyclable materials and then buy back the recycled products made from those materials. The system guarantees markets for recycled materials by stablilising the demand for recycled products. Organizations that institute closed loop systems create a direct link between purchasing recycled products and reducing the volume of waste. Collecting plastic bottles in a park and using them for railroad ties for park landscaping. 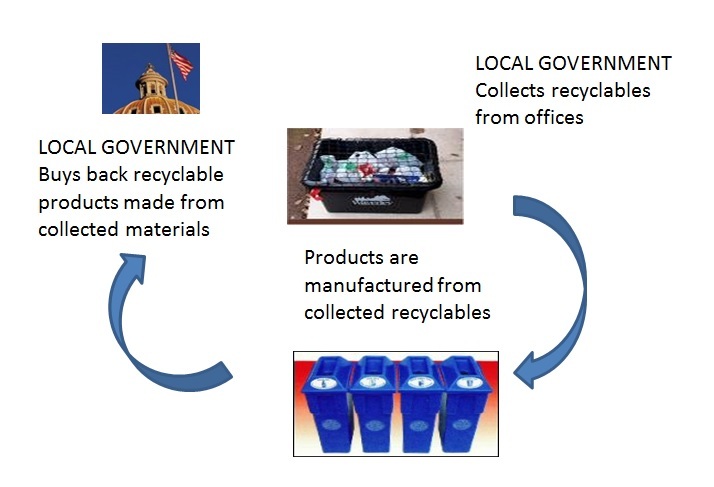 The closed loop concept offers great potential for state and local governments. A state system could entice a recycled paper mill or other manufacturer of recycled products to locate in the state, creating jobs and helping the local economy. Closed loop systems also require close working relationships among solid waste, purchasing, building management, and economic development agencies. Who will be the key players in ensuring the supply of materials? Who are the key players in buying the recycled products? How will the two groups interact? If the project involves state and local agencies, are cooperative marketing and cooperative purchasing agreements available? If not, can the state and local agencies establish such agreements? What volume of products (by dollar volume and weight, if available) do participating agencies buy in the above categories? Are there specification or procurement impediments to using recycled products? Do you need legislative remedies? What agreements currently exist to collect and process recyclables? What agreements exist to buy recyclable materials? What are the length and terms of those agreements? Can you establish long term agreements to collect and process materials and to buy recycled products? How will you identify potential haulers, processors, manufacturers, and vendors? Will it simply be an open bid situation? What are the incentives for these organizations to establish agreements to recycle materials into new products? Do state and local governments have control over enough recyclables and buy enough products to make the program worthwhile? What recyclables and products will you select? What are the criteria for the selection? Whom will the state and local governments contract with — the hauler, processor, manufacturer, or product vendor? How will prices fluctuate with the market? Is a local manufacturing facility a requirement for participating? Will the closed loop system be enough of an incentive, or should you use it in conjunction with other incentives? If the closed loop system is designed to entice a new manufacturing facility to locate in a state or local government, how will the contract be structured to be enough of an incentive to locate a facility, but timed so that collection and purchasing are on line for the facility? How long should the contract be? How can you guarantee the supply and demand contracts so that other processors will not offer a higher price, or suppliers offer a lower price for the recycled products? One caution on closed loop systems – do not expect the recycled material vendor to separately track each load of recyclables through the process. Such tracking systems may be very costly and can eliminate any savings from the closed loop system. These questions require a great deal of research and study prior to establishing closed loop agreements. The opportunities for closed loop recycling, however, make establishing such an attractive purchasing option. * Materials with little or no packaging. The City of Berkeley, California calls the process precycling – thinking about the recycling and making correct buying choices before we buy a product. * Use electronic or computer mail. Purchasing officials should work closely with recycling coordinators to be sure that the products they purchase can be recycled in existing recycling programs. Agencies can buy a variety of paper products that they can recycle in their office recycling programs. Switching to white ledger and legal pads, for example, will increase the value of your wastepaper. You can replace plastic window envelopes, which are difficult to recycle, with open or glassine windows. Mailing labels and other sticky products should be water soluble to permit recycling. Print reports on recyclable paper (generally non-glossy without glue bindings). These techniques and others can improve the value of your wastepaper by eliminating contaminants. There is one situation where buying recycled and recyclability may conflict. Recycled computer paper with high recycled content (as much as 100 percent post-consumer material) is available at costs often lower than virgin or other recycled papers. The computer paper has high groundwood content, which means that agencies can not recycle the paper with high grade, white office paper recycling programs. (Agencies can recycle the groundwood paper with mixed paper.) Agencies with high grade recycling programs must be aware that the groundwood paper can not be recycled in their white program. They must make a decision between higher recycled content and recyclability of their paper, unless they have the option of establishing separate collections of high grade and mixed paper or a mixed paper only program. To avoid wasteful duplication, consider establishing an inventory control system (computerized, if feasible). Various locations in the same organization can share materials and buy in bulk quantities to reduce unit costs and use less packaging. Purchasing and salvage officials should cooperate in establishing the inventory control system. Salvage officials know which products they can reuse or recycle. They can inform you of available products or suggest products that are easier to recycle. Salvage officials can sell or donate usable equipment to other agencies, governments, citizens (through auctions), rebuilders, recyclers, and nonprofit organizations. Large organizations can use their purchasing power and specifications to influence suppliers to reduce waste volume and toxicity. A specification for packaging can require manufacturers to provide recyclable paper or prohibit using inks that contain toxic metals such as lead or cadmium. You can also require manufacturers of automobile or truck batteries to accept used batteries for recycling before buying replacements. Public and private organizations should examine opportunities to donate no longer needed items to local reuse organizations and to purchase used items at reduced rates. For further information on reuse, see the Reuse Development Organization web site at www.redo.org. Organizations should donate, re-manufacture or recycle obsolete computers and consider whether they can obtain usable computers (for internal use or for telecommuters) from local computer companies. Public and private agencies are often held to strict standards of environmental performance. These standards can include waste disposal, health and safety concerns (for employees and public health) and overall environmental regulations. As a result, organizations are establishing programs to purchase products that have a lesser effect on the environment. Environmentally preferable products and services are products and services that have a lesser or reduced effect on human health and the environment when compared to competing products and services that serve the same purpose. This applies to raw material acquisition, as well as product manufacturing, distribution, use, maintenance and disposal. Conduct routine maintenance on products and equipment. For example, rotating and properly inflating tires will extend their life. Vacuuming and cleaning will make carpets last longer. * share information with others. Set up a system to designate recycled products and purchases in your system (a separate code number or other distinction will suffice). The work sheet on page outlines the information you will need for your records. Was there any good or bad feedback from users? Evaluate your buy-recycled program on a regular basis (at least annually). Remember to give yourself credit. Agencies often forget to tell anyone that they have started a buy-recycled program. Mention it in reports and send out news releases about how many recycled products you purchased, how much money you spent on recycled products, any savings in using recycled products, and what products you purchased. The publicity is good for your agency and will encourage other organizations to develop similar programs. Total purchases of recycled products [Breakdown by product area (office paper, janitorial papers, plastics, rubber, oil, etc.)]. Total purchases of products and services (virgin and recycled). (Note: Track items 1-3 by dollars and quantities. The purchasing and recycling departments should establish methods to determine the tons of recycled material used to produce the products purchased, so you can report on how much waste you diverted from landfill disposal). Major specification reviews (number and general description, generated by purchasing office or agency). A description of testing programs, including product tested, test methods, and results. 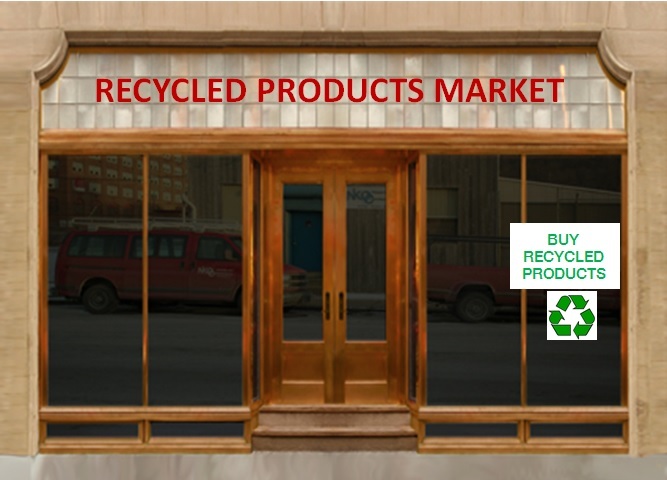 Cooperative purchases of recycled products (including cost savings) and planned cooperative purchases of recycled products. Breakdown of recycled purchases and use by each agency. Listing of recycled product vendors servicing the jurisdiction. Status of efforts by printers, contractors and grantees to use recycled products. Barriers to using recycled products. Success stories and failures (learn from failures). Summary of user experience in using products. Any changes in federal, state or local legislation that affect the program. Recommended changes to improve the program. The Maryland Environmental Service (MES) has designed this list to provide additional information on buying recycled and green purchasing. Please note that many of the sites have links to other buy recycled and green purchasing sites. Because of the rapid changes in the Internet, it is not complete. If you know of other sites to add to this list, please contact MES at 410-729-8531. Information on the 36 existing and 19 proposed guidelines, including product fact sheets. A listserv dedicated to the EPP offers participants access to a national network of “green” purchasing practitioners and advocates. Join by visiting to the Northeast Recycling Coalition (NERC) website and follow the links to EPPNet. Information on environmental products available from GSA. Standards for environmentally responsible consumer products. Massachusetts. Includes product guide, state contracts and green building information.